Monday Marvels members Fahd Khan, Logan Petrik, Sebastian Adams and Elisha Arnold with a few of their repurposed feedbags outside of Wilde Lake High School in Columbia. In a world in which “school shooting” is found too often in headlines and where cyber bullying is a real threat to our children, it seems we could all use a hero or two. Not the fictional type that uses a hammer to fly through the air, can shrink down to the size of an ant, or travels through space and time by casting spells, but real life super heroes who inspire us to do better, treat others better and leave our planet a better place. Enter stage left, Wilde Lake High School’s Monday Marvels: a small group of students participating in the Howard County Public School System’s Work Enclave program who are doing a big service for the community. The Work Enclave program is a supervised work-training program for students receiving special education. 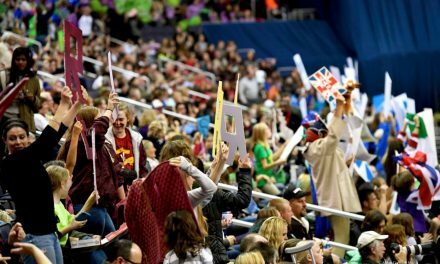 The program is used as a stepping-stone between school and independent work for those students who need a higher degree of support or supervision. 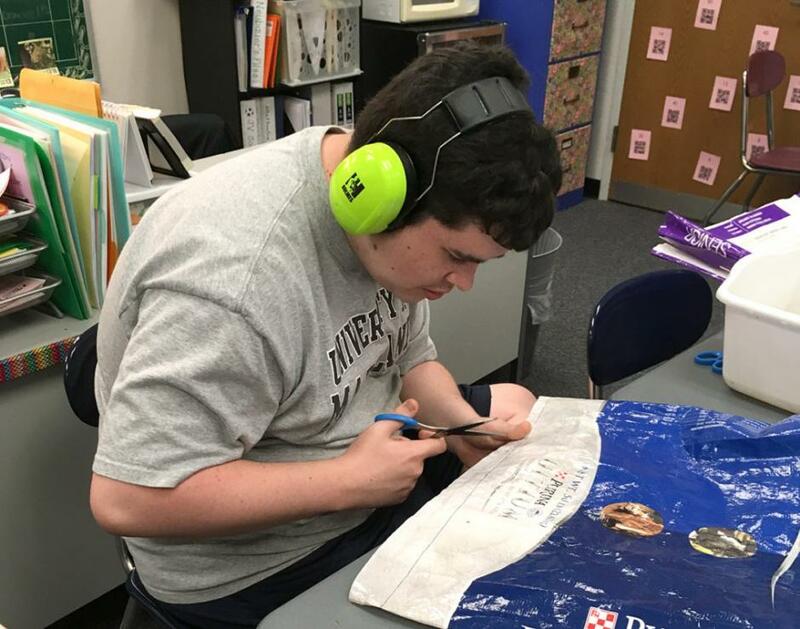 Each program consists of a small group of students who perform basic, repetitive tasks under the close supervision of special education personnel. The goal of the program is to give students a method to allow them to achieve success in the community and learn skills to work independently. Alice Slater, a foxhunter, dressage and trail rider, has been a schoolteacher since November of 2001, and recently took over the Academic Life Skills program at Wilde Lake High School. Through the program, she works with students who have cognitive disabilities. 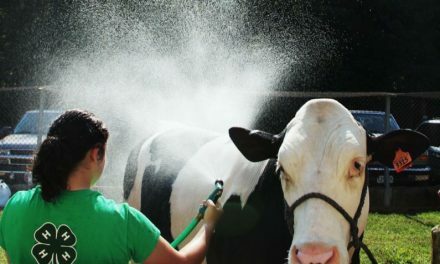 Her class this year consists of six students, ages 16 to 21, enrolled in the Work Enclave program. The students travel to various locations in Howard County to work within the community, but Ms. Slater, as the students call her, decided to put a little twist into the program based on her equestrian interests. Picture a comic book text bubble with a light bulb, a feedbag and a grocery store above Ms. Slater’s head… and the feedbag project began. 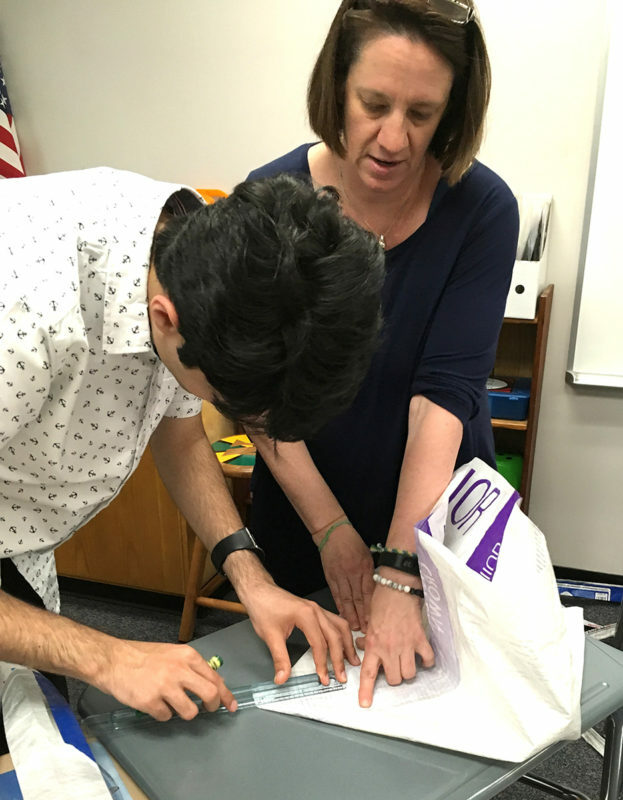 Ms. Slater had already made a few recycled grocery bags from empty feedbags for herself and some friends, and decided it was something that these students could learn to do. But first, she wanted them to form a company to learn about corporate America and building a product from scratch. 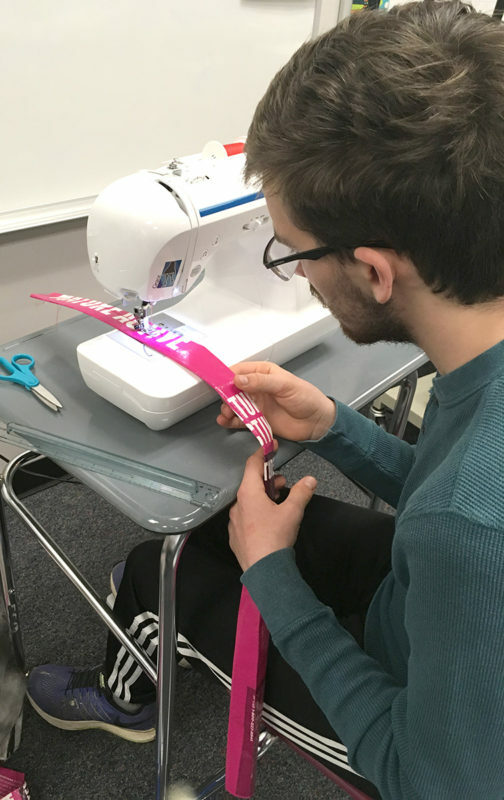 “I explained what it meant to form a company and they created their own name and we passed out little business cards around the school stating they were available to help with Xeroxing and other classroom tasks,” Ms. Slater said. Student Sebastian Adams explained, “We came up with a list of ideas and then voted on them. Monday, that’s the day we stay at school. And we all like Marvel heroes like Captain America. I’d want to be him because he is very strong and has a cool shield!” Thus, Monday Marvels was born. The staff at Wilde Lake has been thrilled with their gifts as well. “They love them! The bags are water resistant and can hold so much stuff! And the kids are very proud when they deliver their bags to our staff,” she said. 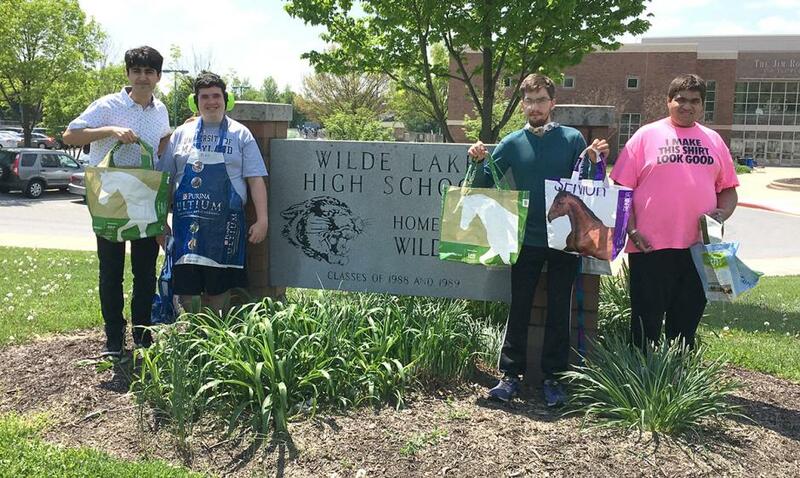 The school community at Wilde Lake has really supported the project, as have TRRC, Pleasant Prospect Farm and Forward Motion Training, all of which now save their bags for Ms. Slater’s class. In addition, Ms. Slater explained how the class is learning about recycling and repurposing as well. “Did you know those bags stay in landfills for decades? This project has an environmental impact and they are working as a team to reduce waste.” Ms. Slater is hoping that next year, the school’s Environment Club will join in on the project and be able to sell the bags as fundraisers and such. But in the meantime, Ms. Slater’s Enclave class of super heroes keeps on building community relations, working as a team and saving the environment, one feedbag at a time. Author’s note: I promptly went out and saw “Avengers: Infinity War” after interviewing these students!